Let us not mince words; Tol Barad is a brutal battleground. It’s not just that the fights are intense – they are – and it’s not just that it heavily favors the defense – it does. No, Tol Barad’s brutality is that it can and will break your faction’s spirit. We know that attacking Tol Barad is difficult. Truly difficult. The odds are against your assault team. You need more leadership, more communication, and more willpower to take this island than any other PvP objective in the game. 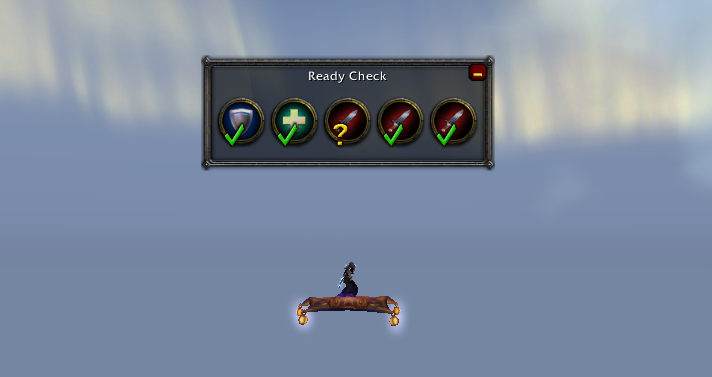 Taking Tol Barad is really hard. Keeping it is hard, too. The obstacles in our way are not trivial, but nor will they stop us. Why do we try to become Kingslayers or reach the gold cap? Why do we chase Insane titles or try for achievements at absurdly low levels? We do them because they focus our attention, sharpen our effort, and make us better players. We do these things not because they are easy, but rather because they are hard. We choose to win Tol Barad. 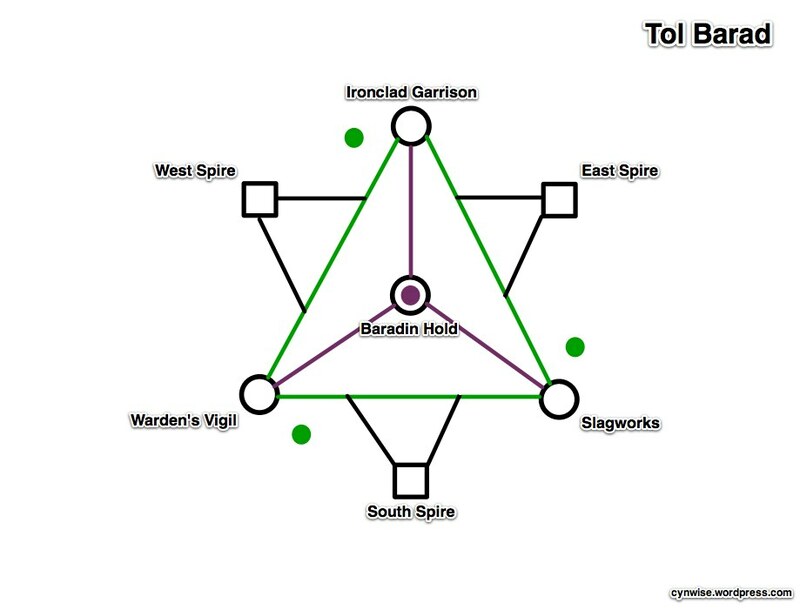 Above is the logical map of the Tol Barad battleground. The objectives for each team are relatively straightforward. Attackers: Control all three bases (ICG, WV, Slag) at the same time before time runs out. Defenders: Prevent this from happening. 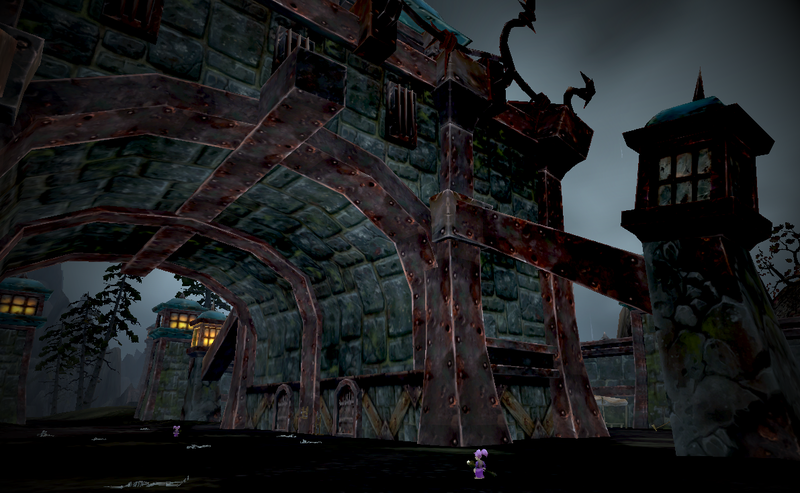 Tol Barad is a battleground of motion and flow. A base is yours when you have more people inside its walls for longer than the opponent. Controlling bases is not about stealth or individual heroics, of elite groups going to capture flags. Defensive control is achieved by letting your troops flow like water from one objective to the next, of overwhelming each node with volume. Offensive control is gained through striking quickly at the right time to disrupt the defensive flow, of seizing the initiative, and of timing the capture of bases just right. 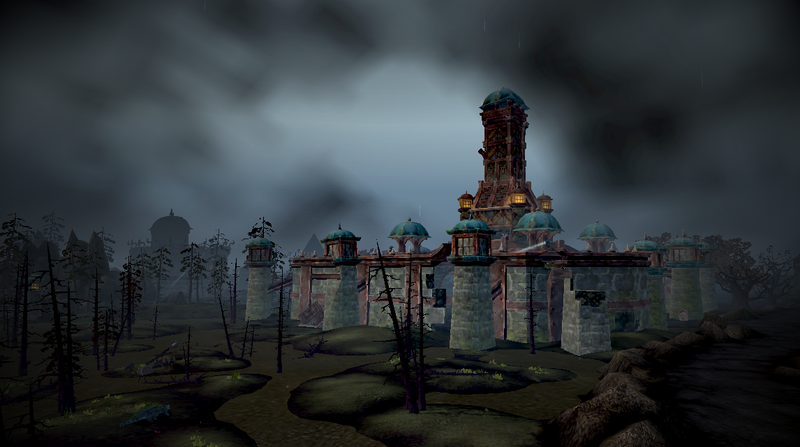 To understand Tol Barad, you must understand how troops will flow. Your troops, your opponent’s troops; in life, and in death. You have to understand both the terrain and the resurrection vectors of where you fight. If you stand your ground, stubbornly holding onto one node above the others, the battle will flow around you and wear you down until you lose. If you scatter like the wind across the map, you will not have the focus to take any base; disperse, and you will lose. At any individual base, the attackers have the advantage over time. Attackers who die will respawn close to the base every 30 seconds, about 5 seconds away from reentering the base. Defenders who die will rez back in Baradin Hold, about 15 seconds away from the base. As a battleground as a whole, however, the defenders have the advantage over time. Defenders who die will respawn 15 seconds away from any given base (the purple lines), allowing them easy access from node to node. 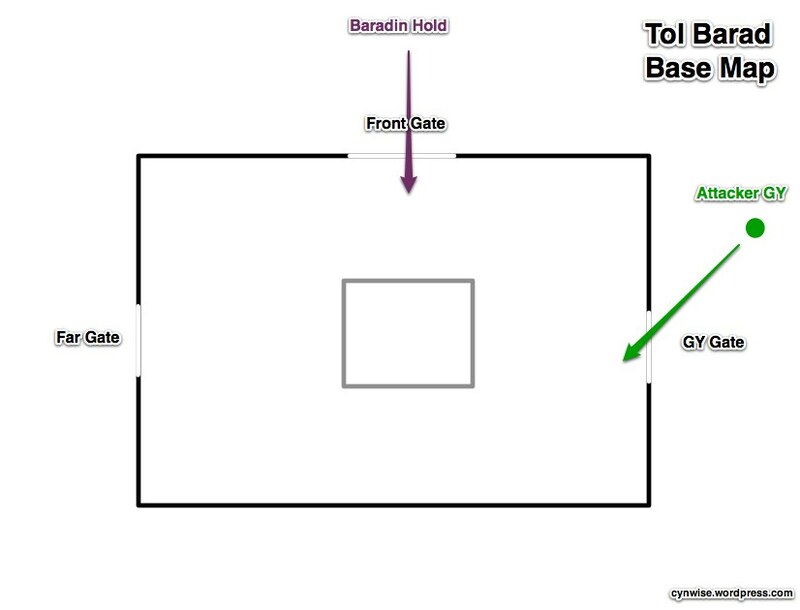 Attackers are forced to go around the triangle (the green lines), which takes 35 seconds to go from the front gate of one node to the front gate of another node. If Attackers die and go counterclockwise around the map, the time is reduced to about 25-28 seconds. If they go clockwise, it is increased to almost 45 seconds per move. The key to winning Tol Barad is understanding the tension between these two fundamental truths of the battleground. Move as a cohesive unit to establish numeric superiority at a single location. Flow troops away from that location when it is attacked to strengthen the next location. Delay the attackers as long as possible at each node without reinforcing it. Move as 2-3 cohesive units to establish numeric superiority at each base. Flow troops away from a winning battle to counter the flow of the defense. Delay the defenders when they are not at a node; distract and scatter them so they cannot congregate. If the Defenders can stay together and flow from base to base, they will win. If the Attackers can disrupt the Defender’s flow and scatter them, while not themselves dispersing, they will win. 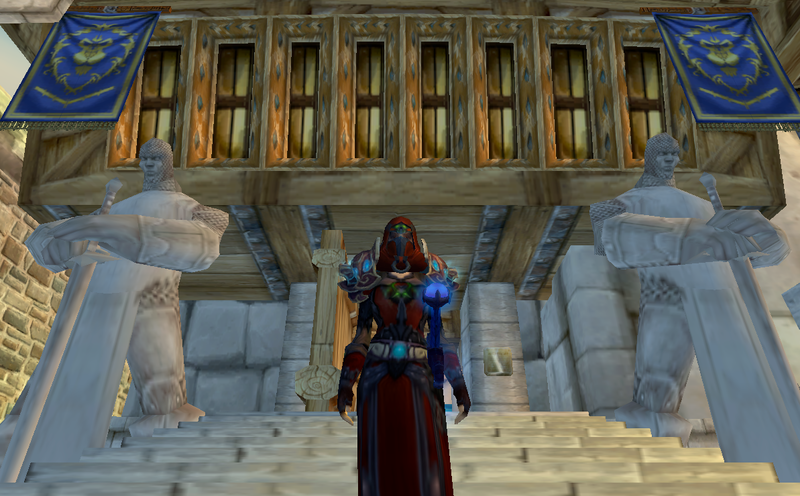 Tol Barad is heavily weighted towards defense. That doesn’t mean that you don’t have to try on defense, but rather that if you put forth the same effort as the offense, you’ll likely still win. Nothing in life or PvP is guaranteed. This game doesn’t hand you Tol Barad just for showing up. Begin by defending a single base with every person on your team. Everyone on your side goes to that one point until it is attacked. When your troops die, you do not reinforce your current base; start moving everyone to the next base instead. Chose the emptiest base to move into. While clockwise motion is slightly more advantageous than counterclockwise (the latter favors the attackers), to you all bases are equal. You can, and should go, counterclockwise if necessary. That’s it. Flow around the triangle to where your enemy is not, and you will win. The only people who should not be in the main group are your reconnaissance units: leave one stealther at each base with strict orders to NOT ENGAGE. They are there to count heads, report enemy movements, and nothing more. You do not need to stay at one base on defense. You can move around the triangle and overwhelm the forces holding each base. As long as you attack with more people – hopefully your entire group – then you will take the base back under your control quickly. Pay attention to where your dead teammates should be going next. Give clear instructions to dead players so that every 30 seconds you can send a new wave of troops to the correct destination. If you are overwhelming a base, have the rezzers rejoin the main force. If you are encountering stiff resistance at a base, have the rezzers move against an empty one. If you are in the graveyard and are not sure where you should go next, ask. The Defenders should never actively assault 3 bases at the same time. If you leave token forces at 1 or 2 bases, but strongly fortify a 3rd, you cannot be beaten when the weak sites are lost. If you divide your forces equally between all bases, you’ll lose. But you can certainly keep moving forces around and prevent the attackers from capturing any bases – it’s actually quite trivial to shift your forces to make the battleground a 0/3 match if your troops are good at assaulting positions. Sometimes, you will find yourself down 2/3 bases. The temptation will be to go to the empty base, to reinforce your last stronghold. Resist. Open your map, and look where all your people are. If they’re already at the last base, then go there. If they’re not, go to where your troops are. The more troops you throw at a different base, the faster you can take it. If the empty base is going down, take a different one. The attackers want you to overcommit to the wrong base, to confuse you, to scatter your forces. You have to act like a single unit on defense. If everyone is going to WV, everyone goes to WV and does not stop. No exceptions. If you lose focus, you will lose. If you lose discipline, you will lose. If you stop outside a base, you will lose. If you are alone on defense, you are doing it wrong. If all you do is sit in a base and wait for 25 minutes, then you will win. Your defense must flow. It must be unified. It must be reactive. If you do those things, you will win. Assaulting Tol Barad is hard. It’s quite possibly the hardest PvP objective in the game right now. It is easy to give up, to complain it is too hard, to try to cheat the system. This is a place where despair is the greatest enemy your team will face. You can play very well and still lose. You can win every single engagement and still lose the battleground. 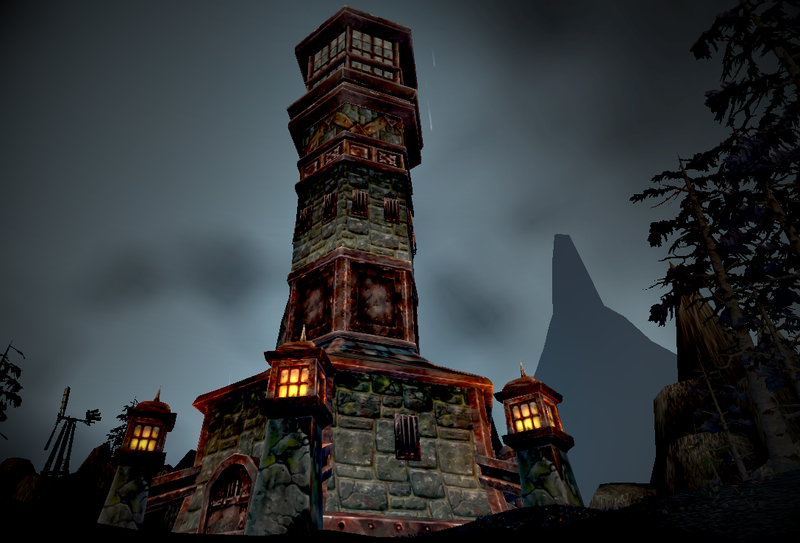 Taking Tol Barad requires attackers to win the last base faster than they lose another. You must take the final objective quickly, and your defenders must concentrate on holding the falling base tenaciously, to give you as much time as possible to succeed. This sounds like a simple truism, but in practice it is quite complex. It is akin to describing juggling or riding a bike with words; how hard could it be to keep three objects in the air at the same time, or of falling in two directions at once while pushing yourself forward? These skills are easy to describe, but difficult to achieve the first time. You must strike hard and fast as a group. You must surprise the defense and subject nodes to massive attacks, not slow sieges. Trickling troops into a base allows the defense time to adapt and flow; you cannot allow this. It is better to pull back and mass your forces outside a base rather than send individuals to be slaughtered. Waiting the extra 30-60 seconds for a larger group is almost always worth it. You must get as many people into a base as possible on the first try. Do not get caught outside, or allow yourself to be drawn out. Do not give chase to defenders fleeing en masse; stay and cap the base quickly while adjusting your forces elsewhere for the incoming assault. When defending the base you’re going to lose, stay alive as long as you can. Run away. Go to the back side, don’t stand in front. Use the features of the base to give you line of sight advantages. The longer you survive, the more time you have given your teammates to take the final base. Standing at the front gate and getting mowed down by the zerg might be noble and brave, but it serves no purpose aside from losing the base quicker. Every person in the base slows down the timer. Stay alive. 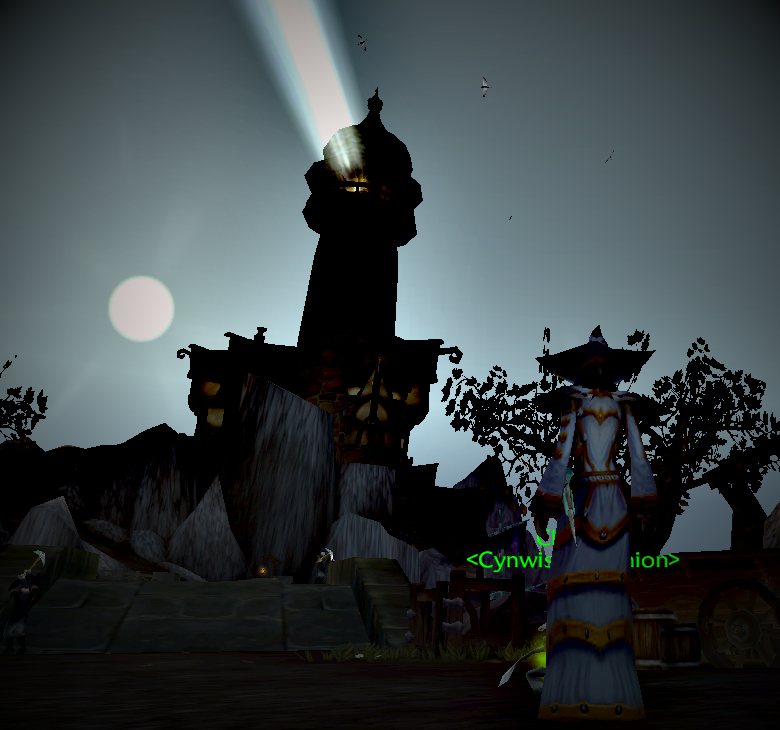 Spies are not just for the defense; taking Tol Barad requires knowing where the defenders are going, where they are strong, where they are weak. Defensive behavior is somewhat easier to predict than offense, so spies placed by the central graveyard can indicate where the next resurrection wave is going, while those near the front of the bases can see the approaching troops. Speed is both your friend and your enemy. You can beat the Defenders back to any given node, but you cannot beat the Defenders to the next node. You cannot circle around counterclockwise in one large group and expect to win. You have to make them go where you want them to go, lead them astray, scatter them, break their zerg. And to do that, sometimes you will have to go fast, and sometimes you have to go slow. When you hold no bases, taking the first one is your priority. You can feint against all three bases equally to determine where the defense is weak and then shift your forces to taking that base, or pressure on three fronts and see which one you can grind out. The former option gives you a choice to go against a strong target instead of a weak one, which can scatter the defense as they determine where to go next. The latter can be used to gauge enemy strength, as well as your own. 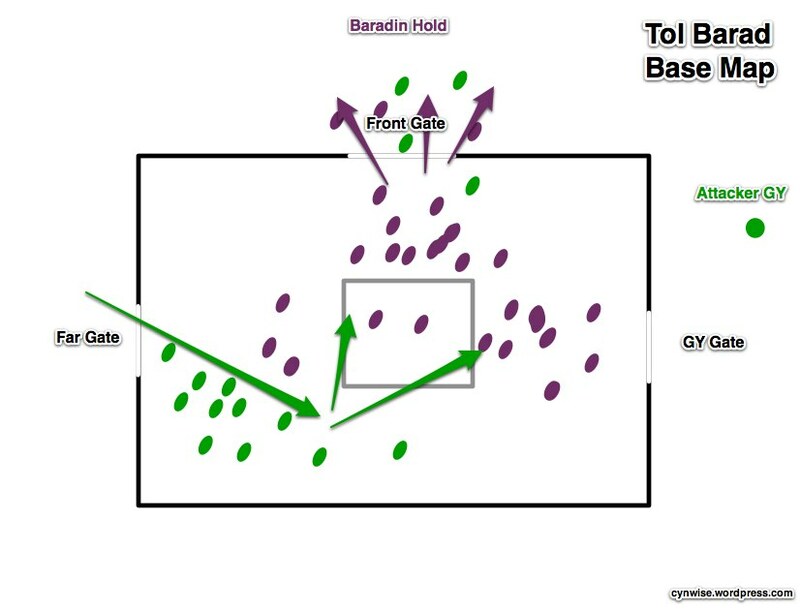 Once you have the first base, you’ve given the defenders a target, which gives you some control over their actions. Be willing to sacrifice that first base if you can take the other two. If the defense is a unified zerg and comes after it, abandon it, split your forces, and take the other two bases. Get out before you are trapped. If the defense is split with some defending and some attacking, split your forces in return and overwhelm their defenses. The only time you should commit to holding a base is when you are buying your team time to capture other bases. This is one of the paradoxes of attacking Tol Barad; your nominal advantage is in taking a base and keeping it, but since you need to diffuse your forces to hold the captured bases, staying to hold a base can be detrimental to winning the battle. Do not let your forces get trapped defending a base they cannot retake. Move to somewhere useful instead. If you are slowly taking bases while attacking Tol Barad, you’re doing it wrong. You have 2 minutes, maybe 3, to take each base. If you can’t, then you need to fall back, regroup, and try again. Try the same place, or a different base – but don’t keep running in from the graveyard to die. Are you chasing the zerg around in a circle? Are you hammering on all three nodes with no success at any of them? Are the majority of your forces at a single node, yet are not taking it? Are your forces all over the map, with very small groups going from place to place? If so, you need to stop and reset your offense. You cannot win the battle unless you do. The key to offense is striking hard while juggling fire. You want to strike hard so the defense doesn’t have time to shift and flow around you. You are trying to achieve victory during a fleeting moment in the battle – when the defenders have finally grown weak in their last base, but have not yet taken another one. You need to toss that last torch into the air just before the next one comes down. Attitude is important. Spirit might (or might not) be useless on your gear, but it’s essential to winning Tol Barad. People all over will have to step up and be leaders. You will have to vocally combat negative feelings and sagging morale when things go against you. Do not let the complainers demoralize your side. You will lose, but when you lose, you will not give up. You cannot expect to win. You are not entitled to win. The game does not owe you a win. Repeat that several times until it sinks in. Get rid of the idea that you should win. Those thoughts are immaterial to the task at hand. You can play excellently and still lose, just like real life. Get over it. Try harder next time. Grow stronger! The game doesn’t owe you a win. You must work as a team. Offense requires more coordination than defense. If people on your faction are not participating – afking, gathering, etc. – call them on it. If people are not following with the group – if they’re randomly running around the map – call them on it. If they are dropping raid (and therefore splitting your groups up) – call them on it. Post the afkers in the forums, if you have to, to try to shame them into helping out. Taking Tol Barad away from the defenders is hard. Really hard. No one is arguing that now. But that is why we do it. The best strategy in the world cannot win the battle for you if your troops cannot execute their mission on the ground. Great leadership and communication is all for naught if you cannot do the one thing that Tol Barad absolutely requires: take control of a base away from the opposing team. While I can’t comment on what the builders of these bases were thinking, having three gates – maybe they were taking notes from the High Clerist’s Tower – the three gates dominate your strategy in each base, and you can use various tactics to turn them to your advantage. Let’s look at how Defenders can use the proximity of the Attacker’s GY against them. The above map depicts the attackers trying to come in through the front gate. The defense is spread throughout the base but sends some strong DPS classes out to meet the rush, maintaining line of sight with the healers. By stunning, slowing, or CCing the incoming attack outside of the base, the attacking players never count towards moving the slider bar. The few attackers who get inside are isolated from their teammates, and while they can cause damage, the attacks are unfocused, unfiltered. At best you might be able to get a few healers down before the attack starts to falter. The second stage of this defense is to separate the initial assault from the rez waves that will spawn. The attack has been split in two, with a strong central defense between the two. The assault might have a chance, except that the defense is doing the right thing again; forcing the attackers to fight outside the base by engaging them there. Over time, the attackers might be able to mount a good push through the GY gate, but it’s going to take some time – time which favors the defenders. 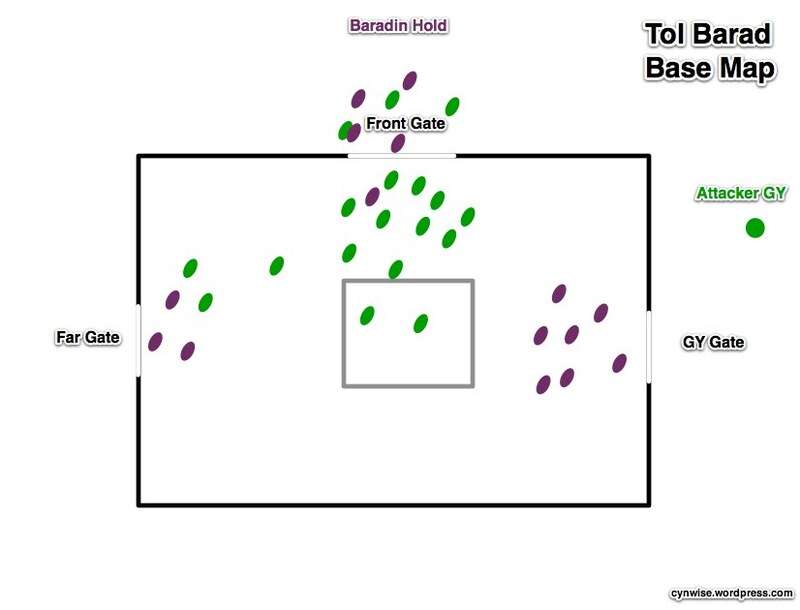 When attacking a base, get inside. 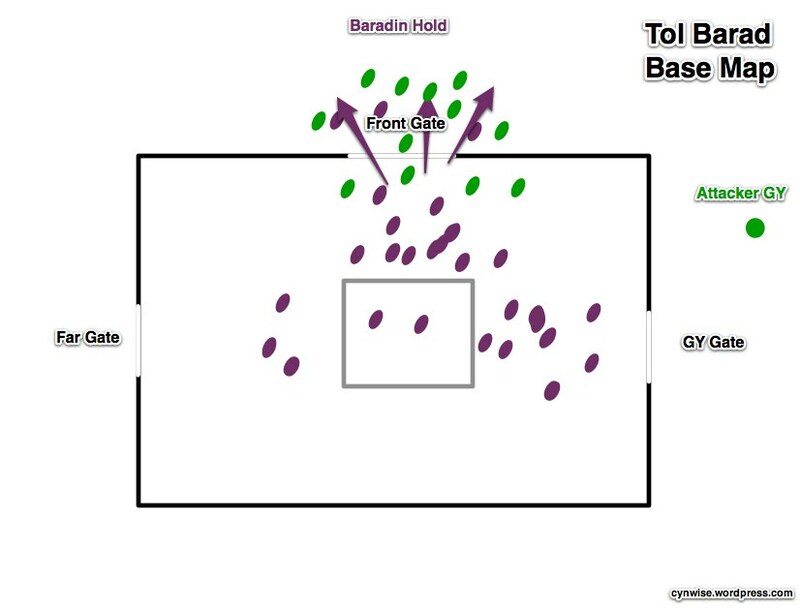 When defending a base, draw the attackers outside. Let’s look at a different way this base assault could have gone. By feinting to the front with a decoy, the attackers are able to draw some of the defenders away and out, while drawing everyone’s attention forward, towards the front gate, while they mass at the far gate for a massed charge inside the base. Now, while the attackers are still spit, they’ve changed the position of the defenders so that they will have to move away from the GY gate to fight one force, while the rez waves hit them from behind. 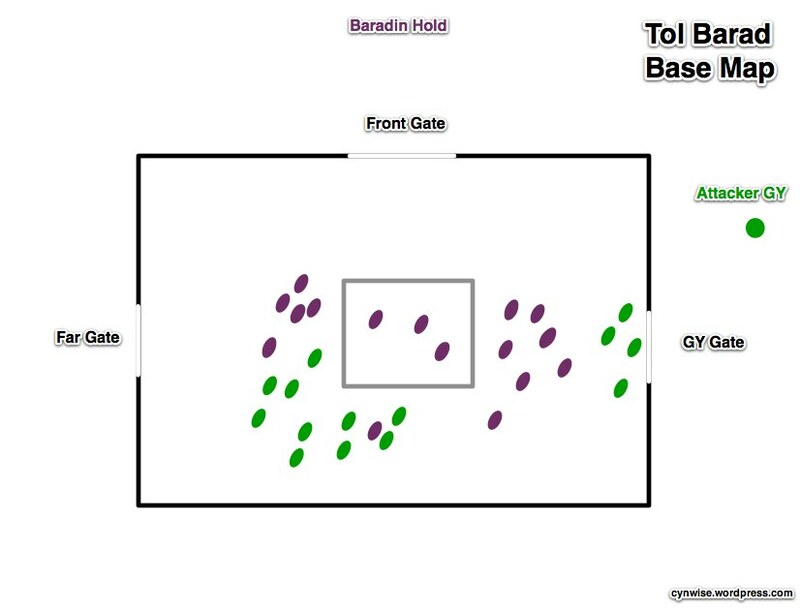 The drawback to this kind of assault – besides needing coordination and planning – is that the attackers do not have any way to intercept the defensive rez waves, coming from Baradin Hold. This usually shouldn’t be an issue except during the final battle. Now let’s look at it from the attackers holding the base. In many ways, this is a similar layout to the previous example, but the roles are reversed and the sides are switched. 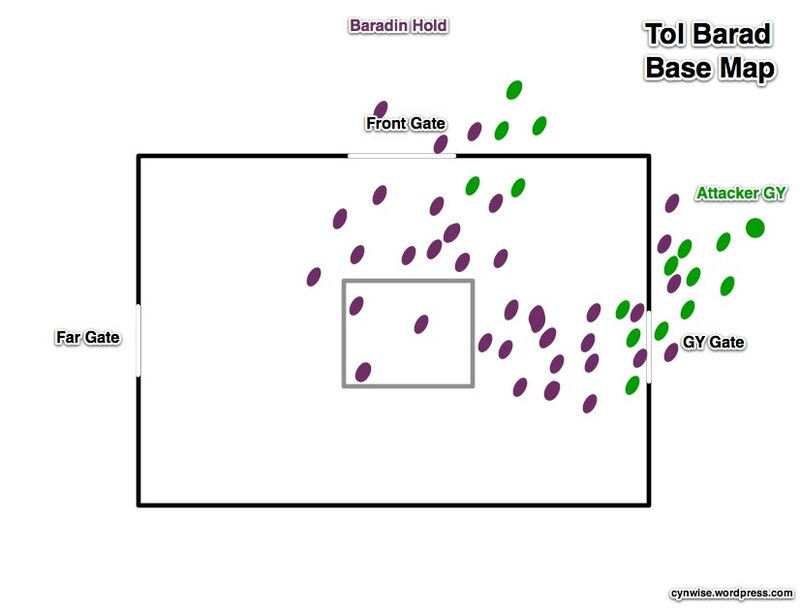 It is generally impractical for Defenders to attack from either of the side gates at first, as the front gate is the closest to Baradin Hold’s graveyard. Instead of defending towards the GY gate, attackers should shift their forces to cover an attack from the far gate instead, as their own rez waves will be there later on to intercept the incoming attackers (and keep them out of the base). Charge the flanks instead of the front, go through the graveyard, and hit the base’s defenders from behind. Reinforcements can then flow in through the front gate, and you turn around and establish a new front at the graveyard gate. The supposed advantage of the attacker’s graveyard is only one in terms of time: the attacking force will return to battle faster than defenders. But because that advantage of time requires them to use a set path, it can be turned against them. This set path is why attackers need to take a base quickly. Drawn out conflicts mean that the majority of the attacker’s force will be coming in from the graveyard, where they can be stopped and overwhelmed. Causing distractions at the front gate is good. Assaulting it in force is not. Attacking in force on the side away from your graveyard lets you establish better positioning within the base. Within the base means you count. Defending a base requires you to meet the opponent outside the base and keep them there. Melee DPS should go out to meet them, ranged DPS should stop them at a distance, and healers should bring up the rear. If you get stopped outside the base, getting inside is your priority. One final word about taking bases: sometimes, your team can’t do it. They may outnumber the defenders but are outgeared; they may be primarily clad in PvE gear against PvP gear; they may just not be very good at PvP. It happens. What you need to do when your team is outmatched and can’t win the 1:1 matchups is try to reset. Move those people to defense on another node, or have them join a larger assault. Reset the fight and pull them out. You don’t have any real control over who does and doesn’t get into Tol Barad, but you can move them around as needed. If ICG is stuck, have everyone at ICG go to WV – and have Slags go to ICG. Taking that final base on offense is going to require your best effort. If the team sent in to do the job can’t do it, shift quickly and try something different. You don’t want to get stuck having the same people futilely grind against a base for 15 minutes when it’s the last one to fall. If you’re defense, though, that suits you just fine. As opposed to strategy, there are some tactical things you can do to help your success in Tol Barad. These apply to both attackers and defenders alike. Form your raid groups before the battle and assign tasks. 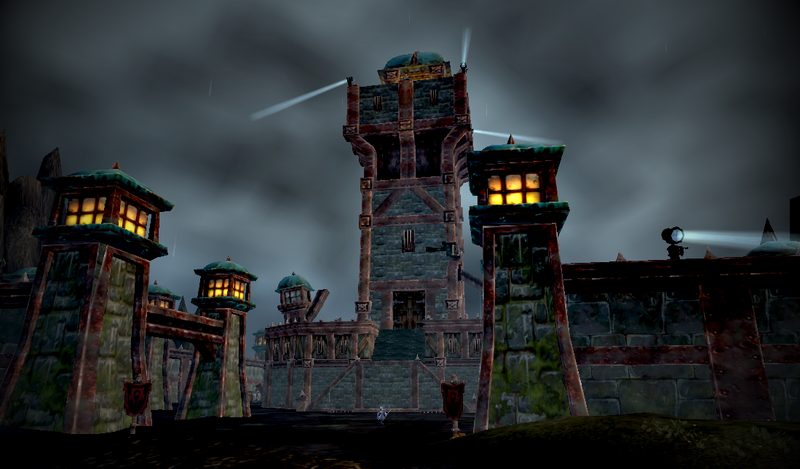 Tol Barad can be taken very quickly by a coordinated offense that starts immediately towards their goals. Remember forming the Wintergrasp raids before each battle? Well, there is no reason you shouldn’t be doing that right now. This is something the offense should certainly do, as it gives them the ability to try for a quick win when the battle starts. Send half to Slag and half to WV, and let the stragglers get ICG, and the game is over. Get your side to use PvP addons. Addons like Healers Have To Die, when used by a lot of your team, can help focus your attacks on the primary targets (sorry, healers) and take them down first. Talk up the utility of your favorite PvP addon in Tol Barad general chat. Use magic to help you move. I’m not just talking about Life Grip (back in base, silly! ), Death Grip (out of the base! ), and various forms of knockback to bounce people out of the base. 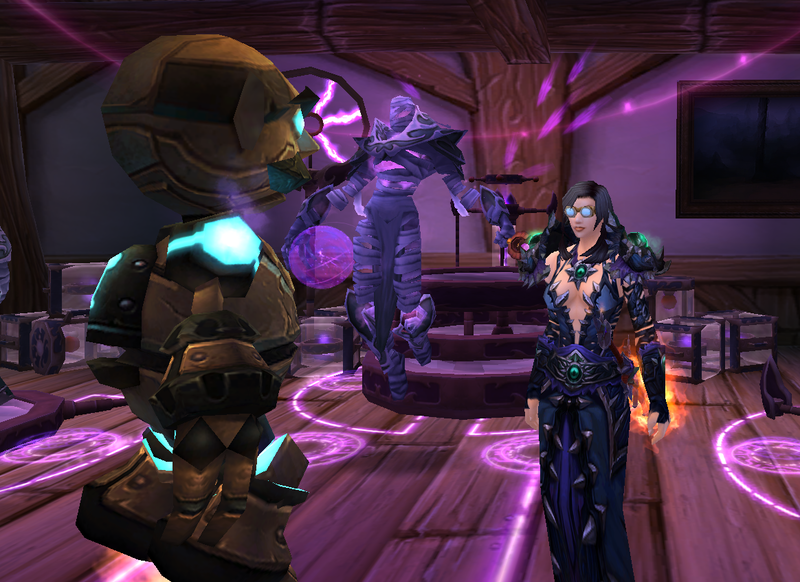 I’m also not talking about various creative uses of your warlock teleport circle, or Blink. No, I’m also talking about using the demon TIVO itself – Ritual of Summoning – to move your forces around. Especially in coordination with guilds and preformed raids, this can help move your healers around to get them to the next hotspot before the invasion happens. You have spies; use them. You should be using spies; stealthed units with the ability to report what they see. Spies in each base can give you troop counts and positioning, as well as join in to take out scouts or healers when your assault comes. Defenders should park someone in each base; attackers might be able to get away with stationing someone in Baradin Hold, but it’s better if the bases are monitored, too. I spend a lot of time in Tol Barad looking at the above map. What’s going on? Why are we winning? Why are we losing? Where do we need people? Where are we strong, where are we weak? This is a hard battleground to win as the attackers. The defenders have a somewhat simpler strategy to follow, one that is also more forgiving of individual errors and weaknesses. Go here, now go here. But just because it’s simple for the defenders and complex for the attackers doesn’t mean that the battleground is responsible for your particular loss. Did you have a plan? Did you execute on that plan? 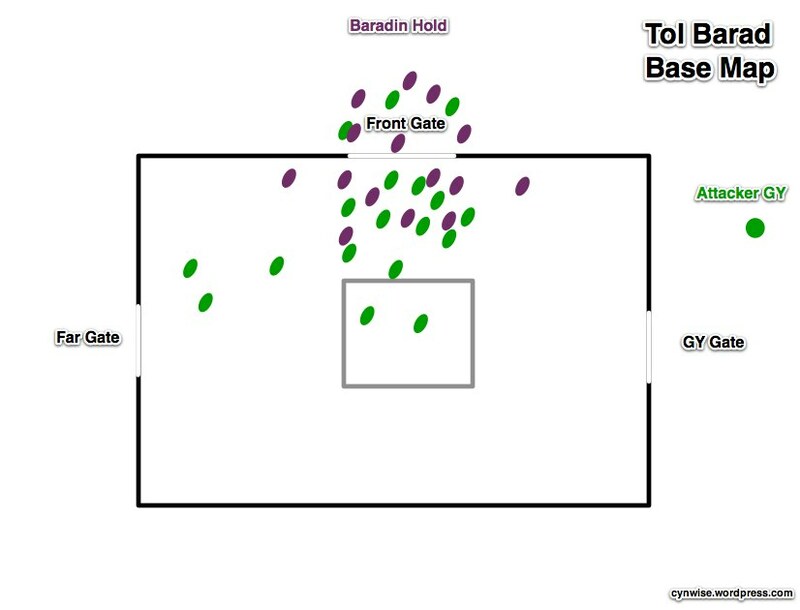 Were you able to take the bases you needed to take? Did you stay together, or did you get scattered? In a normal, balanced battleground, a loss comes down to one team playing better than the other. Maybe you played poorly, maybe they played well – but whatever it was, one team played better than the other. Tol Barad is different. 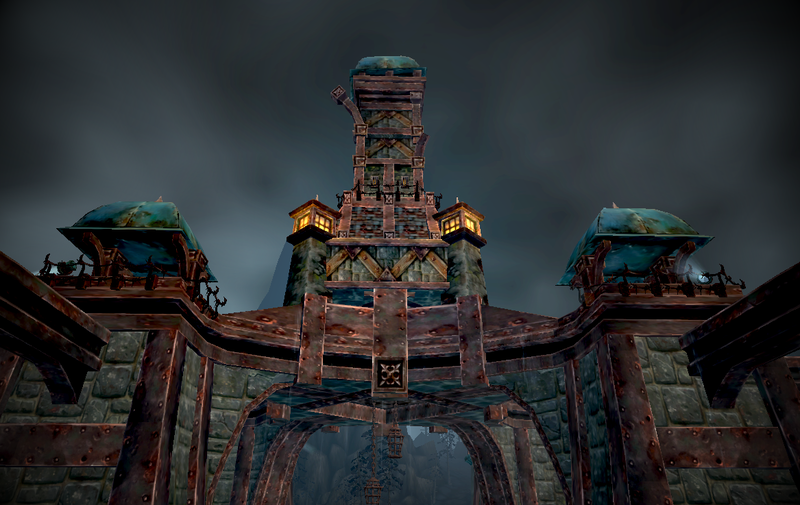 Tol Barad is biased, heavily, towards the defenders. Winning as an attacker should feel big, because it is big. But it’s not going to happen every time. Sometimes, you will do everything right and still lose Tol Barad. That’s okay. Don’t beat yourself, or your teammates, up about it. Get over it, learn what you can from it, and try again in two hours. You’re not going to win Tol Barad all the time. I think that’s the thing that I have learned the most over the last few weeks in Tol Barad – it’s not a no-win situation. This is not the Kobyashi Maru test, a true scenario with no possible way to win. It’s just hard. Really hard at times, but hard. At some point, someone on your server will do it. 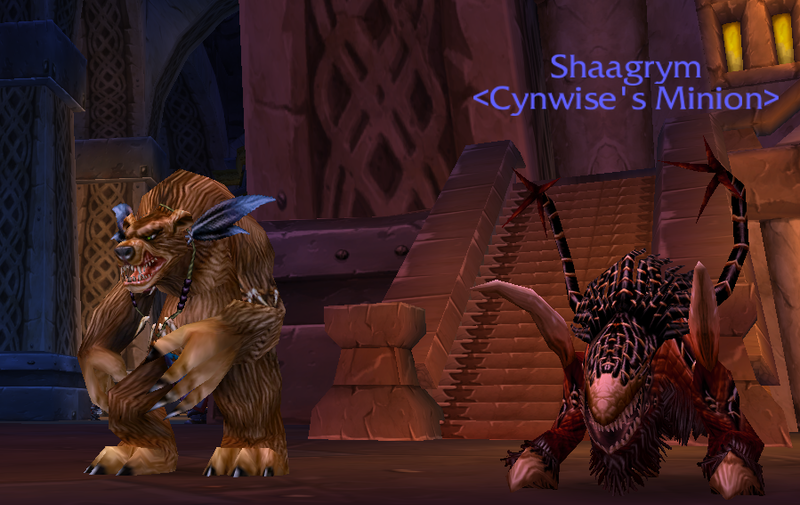 They’ll flip Tol Barad to the other faction. Perhaps they lead a brilliant assault. Perhaps they queue in the late night hours and stay up until the morning making sure it doesn’t switch hands. Tol Barad is neither fair nor balanced. It is a rock that you can dash your faction against and lose repeatedly. It is a place you can hold for a week and then wonder how you lost in a matter of minutes. It is not always fun. It is not always rewarding. It is a hard battleground. But you can win it. 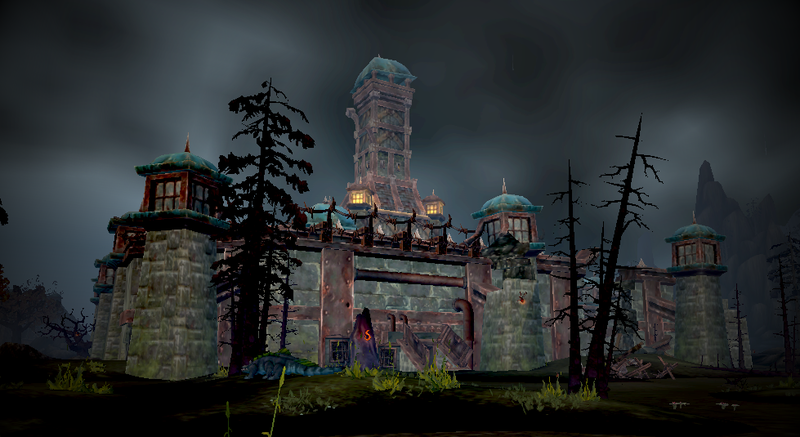 The Battle for Gilneas is one of three new PvP battlegrounds introduced in Cataclysm. It is a relatively straightforward 10v10 resource match between the Horde and Alliance, set in the wonderfully gloomy atmosphere of Gilneas. There are three nodes to control – the Lighthouse (LH), Waterworks (WW), and Mine – and each node generates resources for your side. Each node has a flag you need to click and channel for a few seconds to capture. The more nodes you control, the faster your team gains resources. First team to 2000 resources wins. If this sounds like a 10-man, 3-node Arathi Basin, well, that’s because it is. This is a half-court AB, designed to be fast and engaging. Let’s take a look at the topology of the battleground. If you haven’t seen one of my topological maps before, I go into a lot more detail in their original post, but the general idea is to only present the logical flow between objectives. Large circles are capturable nodes, small filled in circles are graveyards, and colored circles are graveyards which do not change control. Squares are important locations, but non-capturable. Terrain is pretty much ignored. Looking at the map, calling BfG “a half-court AB” isn’t really a joke – it’s the AB map cut in half, with the Blacksmith removed. The three nodes are arranged in a rough triangle, with the Overlook in the center. Capture two of the nodes and hold them to win. Any two will do. The Overlook is one of the more interesting elements of the Battle for Gilneas. It has no flag, no resources – but you can see every single node from it. This is something that sets BfG apart from AB – the ability to actually see every flag from a single point. In AB, at least two nodes are always hidden from sight from the absolute best vantage points (Farm, Lumber Mill, Stables). Not so from the Overlook. There is a tactical advantage to holding this spot, though it comes at the cost of not fighting near a flag. The flow of this battleground is, thankfully, very linear. 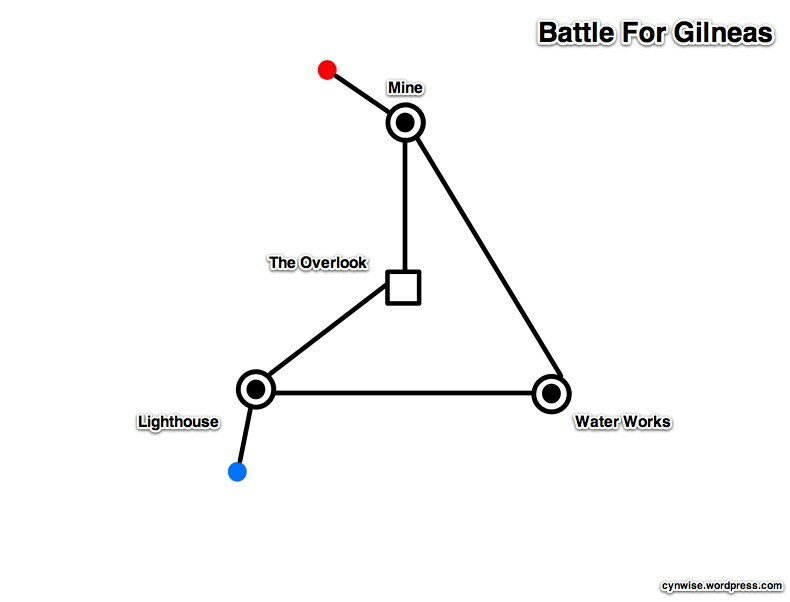 You are fighting within a triangle to capture nodes at each point. In the center is a vantage point that lets you see what is going on, but ultimately you will shift your team around the triangle. The terrain in this battleground is really well done. While the flow of the battle is deceptively simple, the terrain is varied and forces you to become acquainted with the numerous choke points and obstacles between each node. A river cuts through the southern part of the map, encircling the Waterworks, but is not a huge impediment. The area around the Overlook is full of gullies and ridges, perfect for funneling your opponents into traps and area of effect spells. Like with any other battleground, I encourage you to just run around on the map and see what it’s like. You can experience it without the thrill of combat using the new War Games feature. I am absolutely serious about this: you want to win, fight at the flag. I am amazed at how many people I see who have apparently forgotten how to fight at the flag in my short time in this battleground. The attackers let themselves get pushed away, intercepted before they ever come close to capping the node. The defenders let themselves get lured away down the road to the Overlook, until half the team is fighting over a piece of land that only has intelligence value, while the node gets capped behind them. That kind of behavior doesn’t fly in Arathi Basin, and it won’t fly in Gilneas, either. Get to know the terrain. If you’re attacking, use the buildings around the various nodes to mask your approach. Approaching from the Water Works seems to have more cover than the Overlook. Get between the flag and the graveyard and force the defense away from the flag. Make it so the rezzing defenders have to go through you to get back to the node. Defense, intercept them away from the flag, but then fall back and do not chase. Don’t get caught up in the thrill of it all and let them sneak around to cap the undefended node. Reinforcements arrive quickly in BfG, so call out incomings early, often, and as accurately as you can. If this all sounds like the strategy for Arathi Basin, well, that’s because it’s the same strategy. First to 2000 points wins, after all! The smaller team and map size makes for some pretty intense fights around the flags, with everyone having to contribute to succeed. But it’s basically the same game. I like the Battle for Gilneas. It’s taken many of the good qualities of Arathi Basin and Warsong Gulch and combined them into a fun game. It fills out the 10v10 bracket nicely, a nice addition to the smaller format that formerly was limited to Warsong Gulch. The rules are familiar, but the map is all different, which makes for an interesting and fun experience. Just remember – fight at the flag! In 1931, Harry Beck created the first version of his revolutionary map of the London Underground. 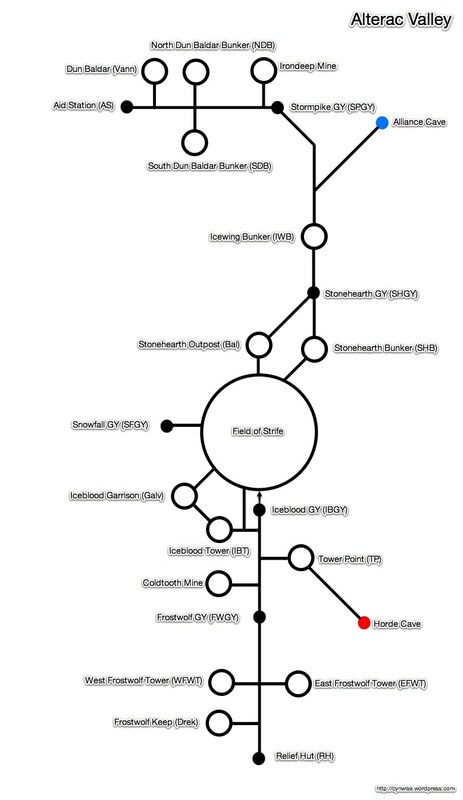 Instead of accurately overlaying the train routes over a geographic map of London, Beck presented the topology of the Tube, divorcing it from the complicated, messy reality of the physical world and giving the logical connections between stations instead. This innovation has been rightly copied on metro transit maps throughout the world — presenting the flow of bus routes or subway systems is much more useful to a traveler trying to find the right line and stop than knowing where those lines and stops are in relation to the real world. Topology is different from topography. Topography deals with the shape of the land, and is often seen in geographic maps. Topology deals with spatial flow. A topographic map will show elevation and surface structures; a topological map will show how different points relate to each other. Practitioners of engineering, both Gnomish and Goblin, will recognize this type of map in circuit and network diagrams. The physical layout of the network is not as important to understanding how it works as the topology. Engineers need to know what connects to what when troubleshooting a design problem, not neccessarily where those things are located on a circuit board or network. Often elements of the network can be completely glossed over because the details are irrelevant to the discussion at hand — the concept of the Internet as “the cloud” comes from this reduction. I’m used to looking at geographic maps for battlegrounds. 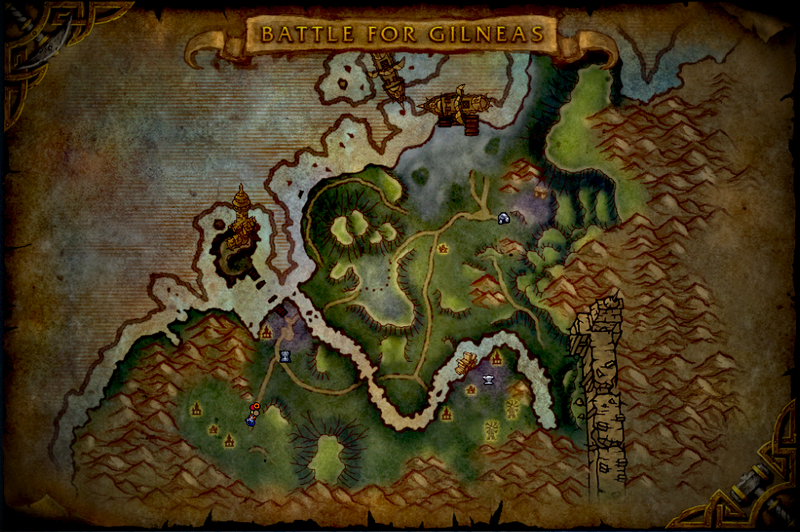 The in-game maps show terrain, the location of objectives and obstacles, and your position with accurate scaling. These maps accurately reflect the battlefield and are useful tools. Every twist of every path is accurately documented. But there are times that these maps fail us. They present a lot of information you don’t need when thinking about strategy. They don’t convey the objectives of the battleground, or the flow from goal to goal. They aren’t good tools for new players to learn from, either — much like a geographic metro transit map, there’s a steep learning curve to know where you are and where you go next. In talking with Nibuca on the Twisted Nether Blogcast, it occurred to me that the maps are part of the barrier to entering (and enjoying) the battlegrounds. “It’s not obvious what you’re supposed to be doing,” she said, and I agree completely. While dungeons are, for the most part, linear affairs, battlegrounds are not. The objectives are not clear when you first zone in, and — here’s the kicker — knowing where to go next is never obvious. Nearly every battleground has a symmetric map, which means there are no cues like “follow this corridor.” Battlegrounds are more complicated than that. Using the London Tube map as an inspiration, I think looking at the battleground maps logically and topologically, instead of geographically, can help overcome this barrier to entry. And with rated battlegrounds coming in Cataclysm, more and more guilds are going to be looking at setting up strategies and teaching people to fight in these instances. Hopefully these maps will prove useful for both groups. Normally, I present maps to illustrate a strategy. Here, I’m just presenting maps to give you a different perspective on each battleground. I expect you’ll see me use them again in later strategy posts. I’ve tried to keep each map simple, sometimes absurdly so. This is deliberate. There are complexities to each battleground that are confusing to the new player, and as such have been avoided. There’s a vast amount of tactical knowledge that you pick up running a battleground that can completely influence the fight, but the purpose of a topological map is to point out the flow, not the terrain. Large circle: an objective players can capture. Small black dot: a graveyard players can capture. Dot within a circle: an objective with an associated graveyard. Control of one implies control of the other. Red node: Starts under the control of the Horde. Blue node: Starts under the control of the Alliance. Colored dot: A graveyard that cannot be captured. Usually, but not always, a spawn point. Solid line: bidirectional path between nodes. Arrow: one-way path. Usually involves jumping. Square: Resource that can’t be captured, but can be used by one side or another. Let’s take a look at the simplest battleground map of all, the Eye of the Storm. 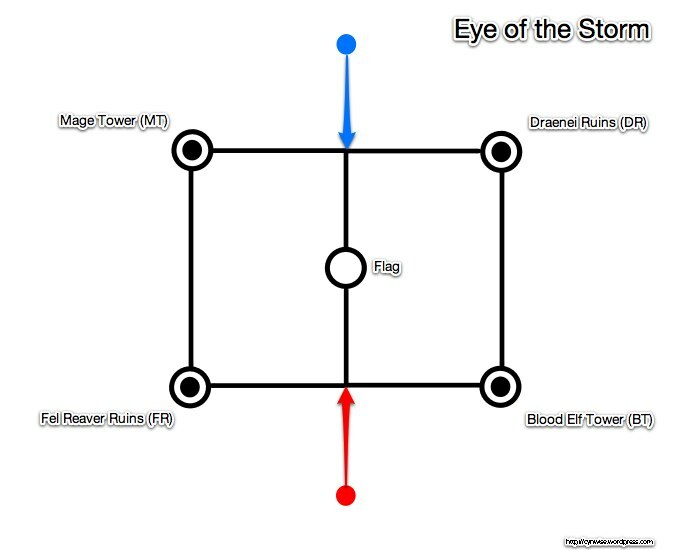 There are five nodes you can control in Eye of the Storm: the 4 bases and the flag. The four bases at each corner have graveyards associated with them, so they have the bulls-eye symbol associated with them. Each node has only two approaches. The flag sits in the middle of the battleground, again with only two ways to access it. There is no graveyard associated with controlling this objective — instead, it’s something you have to capture and then return to a controlled base. Each side starts with one graveyard that cannot be captured; these are the spawn points and cannot be captured by the other side. Players must jump down from the floating rocks to reach the main battleground, represented by the colored arrows. There isn’t any way to circumvent the routes shown here: this battleground floats in the Twisting Nether and you would need to fly in order to traverse it. So control of routes is absolute. 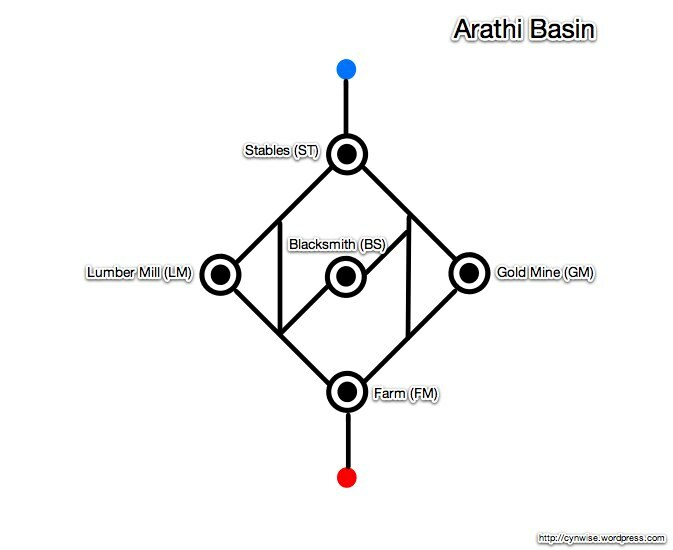 Next, let’s look at a slightly more complicated map: Arathi Basin. Arathi Basin has 5 nodes, each with an associated graveyard. These are the places where you really should fight at the flag. There are two spawn points that cannot be captured by the other side, but can be accessed and camped, at either end of the map. The orientation of the geographic map sets the flow of the map along a NW/SE axis, which can be confusing. The bases are set out with one close to your starting point, one far away, and three in the middle. Unlike Eye of the Storm’s map, it is possible to move outside of the lines in this map, though it almost always involves either going very slowly, falling off a cliff, or both. The Lumber Mill is on a cliff, so characters who can slow fall, levitate, or parachute can go directly to the Blacksmith. Same going from the Blacksmith to the Gold Mine. Going from the Farm or Stables to Blacksmith requires swimming or water walking. Strand of the Ancients is interesting because it’s the only half-court battleground in the game. One team fights to the Titan Relic while the other defends, and then everyone switches sides. So the flow of the battle always goes from North to South, from the beach to the relic. Strand has a lot of little touches that make it interesting. Teams start in different places (landing ships for offense, south GY for defense) than their fallback graveyards (beach and courtyard). Control of the graveyards gives control of resources, not the other way around. Seeing Strand like this really highlights the importance of graveyard control in this fight for both offense and defense. More on that in a later post. The Isle of Conquest has a deceptively simple flow. This is a battleground where terrain, elevation and lines-of-sight matter. The different abilities and vehicles each node grants your team make this a far different place than Arathi Basin, where all nodes have equal resource value. You can win IoC with control of a single node, for example, something you cannot do in Arathi Basin. That said, IoC has a typical circular map. The three nodes in the center force you to divide your forces to focus upon the objectives. In this aspect it’s very much unlike the other 40-man battleground, Alterac Valley, which is a linear map that doesn’t require tremendous coordination to run. Let’s look at AV next. Alterac Valley is a monster of a map no matter how you look at it: there are 24 points of interest spread out in a long North/South battleground. Because the graveyards are separate objectives, graveyard control is its own game within AV. Knowing where to station defenders is paramount as your forces are sent all over the map. However, despite the complexity of content, the flow of Alterac Valley is relatively straightforward. This is not a circular map like EotS, AB, or IoC — it’s linear. Alliance rides South while Horde rides North. Teams can establish chokepoints and restrict the enemy from moving any further up the map. It’s a fascinating, unique battleground, and the map is no exception. Okay, so I love Alterac Valley. Like THAT’S a surprise. Remember how I said Eye of the Storm had the simplest battleground map? Well, despite what you see above, I still think it does. Warsong Gulch has the simplest topology, but not the simplest terrain. There are 4 different approaches into each base, each with strengths and weaknesses. Learning the ins and outs of the bases is essential. Learning the terrain of midfield is also essential. But when I look at the terrain of Eye of the Storm and compare it to Warsong Gulch, it’s a far simpler place. There are two approaches to each base. There are few obstacles between each. 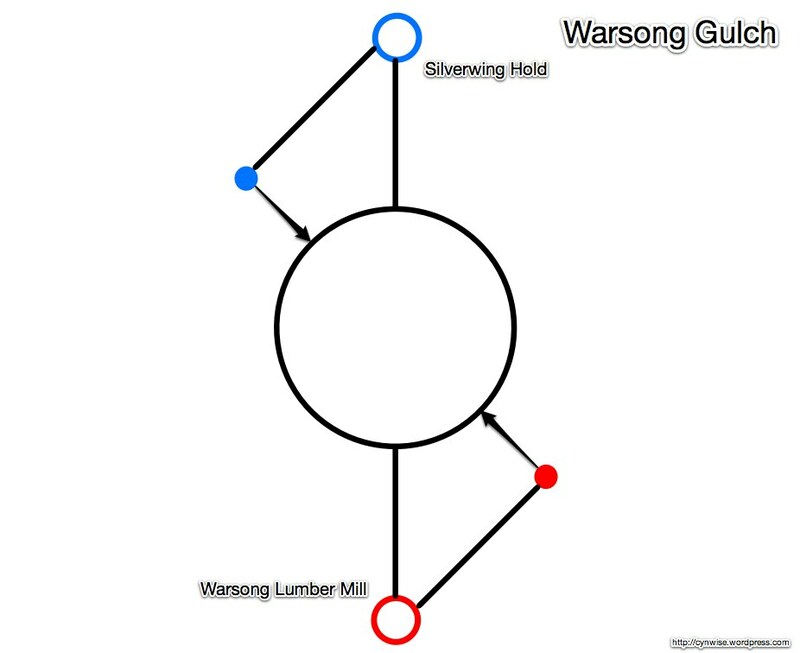 But in terms of the goals and logical flow of Warsong Gulch, it is as simple as this map makes it. There’s your flag, and their flag. Everything else – ramp, tunnel, roof, balcony, midfield – is immaterial. If there was a zen battleground, Warsong Gulch would be it. Though it’s not a fully-instanced battleground, I’ve also made a Wintergrasp map in the same style. Wintergrasp is still relevant to many players, and the points in my Introduction to Wintergrasp still apply. 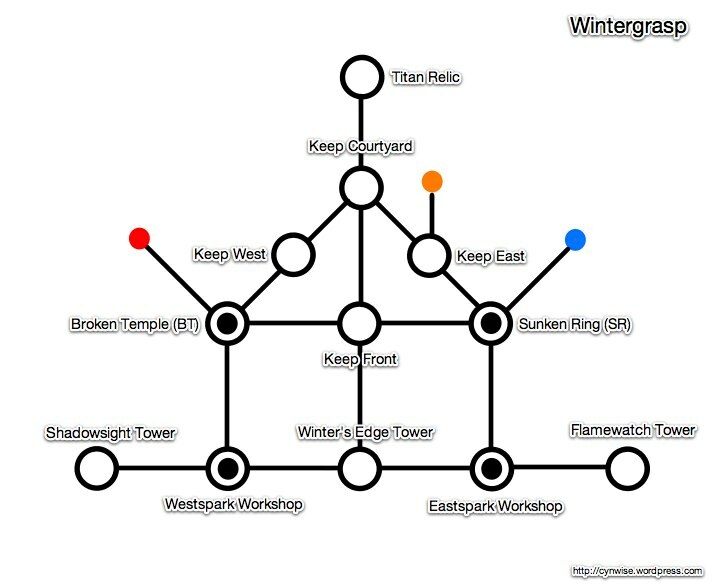 I altered the keep layout a bit to illustrate the flow of the outer ring defenses — breaking into one of the outer keep courtyard doesn’t reduce any of the others, and you have to go through at least one before getting to the inner keep. I said at the top of this post that I didn’t have a specific strategy to illustrate by presenting these maps. That’s mostly true. I think that looking at the logical flow of a battleground is vital to understanding the strategy behind it. But it’s also vital to learning it and making sense of those first crazy runs across the map. I hope you find these maps useful. If you can heal, you should be healing in a battleground. That is the rule. No matter how unfair it is to the players involved, no matter the other strengths of the class or player involved, if you can heal, you should. Forget about the awesome PvP abilities of some of these hybrid classes. Who needs Enhancement Shamans powering a node’s defense, Retribution Paladins dominating front-line combat, or Shadow Priests destroying swaths of the enemy? 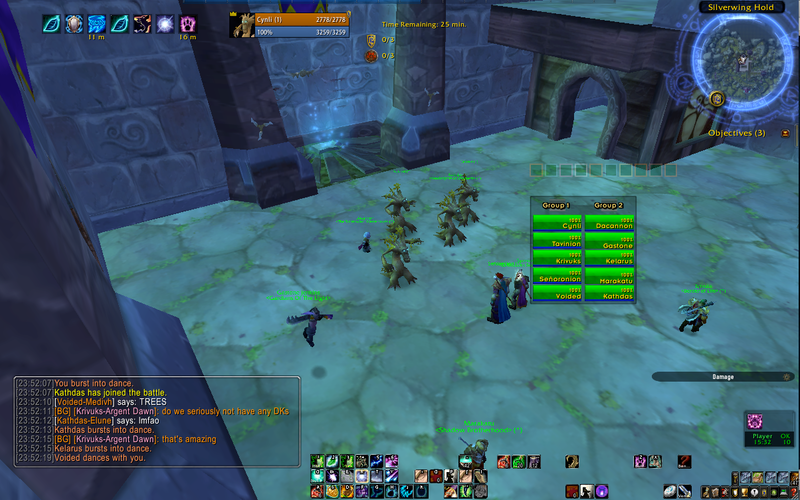 Never mind that Feral Druids are some of the best flag runners and node cappers in the game! If those players want us to win they should be healing! Do you see how silly this attitude is? This ridiculous strawman what happens when you take an observation – healers win battlegrounds – and turn it into a prescription – everyone who can heal, should. Carried to this extreme it becomes patently absurd. Yet, even though it is absurd, you’ll hear well-meaning people say it. I’ve probably even said it once or twice. But the scarcity of healers is no excuse for pigeonholing players into roles they either choose not to play, or frankly aren’t very good at. The source of the problem lies in the lack of defined roles in a battleground. You don’t select Healer, Damage, or Crowd Control when queuing for a battleground – you just show up. Random chance governs your healing team, if you get one at all. So when you look around at the class compostion of your team, you see the potential healer pool. The actual team is far smaller. Good healers win battlegrounds. That statement carries with it a terrible burden of responsibility that no player should be saddled with, especially because it is only part of the whole truth. I propose a new axiom: Good players win battlegrounds. Players who know how to lead, players who know how to fight, players who know how to control the enemy, and yes – players who know how to heal. Battleground raid roles are not as simple as PvE raid roles. The Tank-Healer-Damage trinity simply doesn’t apply to PvP, and is instead replaced by situational roles for each battleground. Within the smallest battleground, Warsong Gulch, I can think of a dozen roles in two different configurations. Zone coverage would be broken down into Flagroom Defense, Midfield / Offensive Support, and then Offense / Flag Carriers, each subdivided into Control, Damage, and Healing. Or you could abandon zones and go with task-based role assignment: Flag Carrier, FC Support, Midfield Control, EFC Hunters. I think that the introduction of Rated Battlegrounds in Cataclysm will have a dramatic impact of how we think about our strategies. PuGs are still going to happen, but I really expect to see more battlefield organization through guilds and general PvP alliances. The incentive to organize is going to be there, so people will be thinking deeper and longer about how their players should work together and the roles they fill. This is really exciting. We could be on the cusp of a renaissance of battleground strategies as more players get involved. We could also be on the verge of losing one of the great charms of battlegrounds, namely the casual, laid-back nature that appeals to many busy players now. PuGs facing premades can be very frustrating for those on the disorganized side. Sometimes, you don’t want something serious, you just want to go pwn some Horde or Alliance, and having to execute a complex strategy is not how you want to unwind. My biggest fear with the introduction of Rated Battlegrounds is that the casual aspect of bgs will be lost. I am holding judgement until we see more about the implementation, and see how that implementation changes people’s playstyle. It has tremendous potential both for good and ill.
There’s an unfair expectation on hybrid classes to heal in battlegrounds right now. My hope is that Rated Battlegrounds will bring about a greater recognition and respect for the other specs those hybrids bring to your team, and that those healers who are there are playing because they enjoy it, not out of some sense of obligation or guilt. Only time will tell if that hope will bear fruit. Battlegrounds are messy, chaotic affairs. To put a Battleground into a PvE perspective, imagine that the only way to raid was to raid randomly. There is no attempt to fill roles; you may have no healers, or you may have no DPS. There is no gear check; not even an attempt to match gear levels. There are no teams, no organization, no defined leadership. The only communication you have is what you can type; there is no vent. Your raid size can vary widely; you might get a 10-man, you might get a 40-man. There’s no social cohesion, no social penalty for failure, no performance review. And you have, at most, 2 minutes to prepare yourself and your team to fight. Trying to get everyone on your team to follow a complicated strategy in this environment is simply not going to happen. Not only do you have no time to evaluate your team and determine who should fill which assignment, you have no way to ensure that players will do their jobs. So any strategy you adopt must be simple, easy to communicate, and independent of the ability level or roles of the participants. Easy, right? Warsong Gulch: Protect the FC and kill the EFC. Midfield control is a means to one of those two ends. Stick together in groups both on offense and defense. Arathi Basin: Take three bases and fight at the flag. It’s important enough to repeat again: fight at the flag! Travel in packs and don’t engage in the road. Defend your nodes. Alterac Valley: Take and defend the enemy towers while recapturing your own. Trapping the enemy in a bad graveyard is part of this, but the towers are the key to AV. Eye of the Storm: Control 3 bases, or 2 bases and the flag. 3 bases > flag. The flag is a buglight, it is noob bait, it is a shiny thing to distract you from three bases. But it can also help you win when you only hold 2. 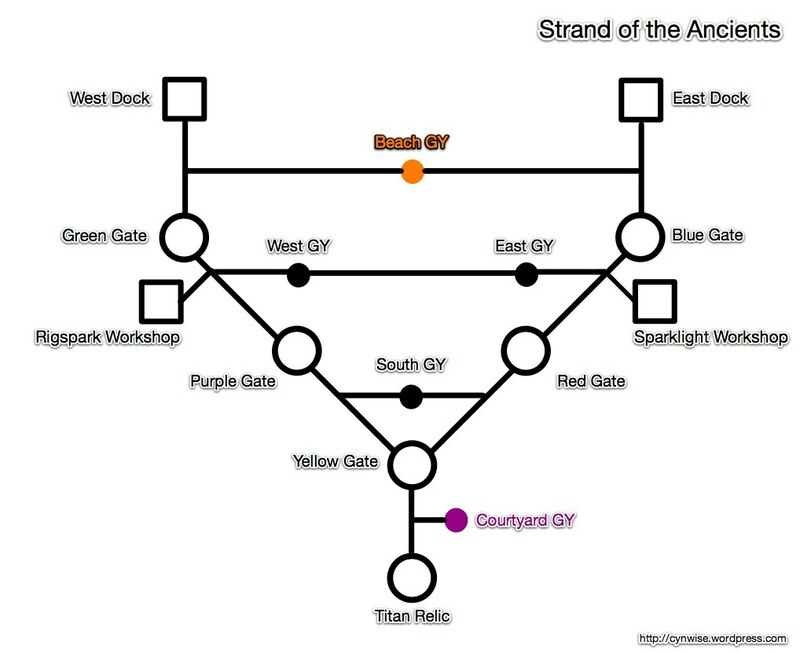 Strand of the Ancients: Kill the Demolishers if you’re on defense, and protect them if you’re on offense. Use bombs when you can, stay away from the cannons, practice good graveyard control — but SotA is all about the Demolishers. 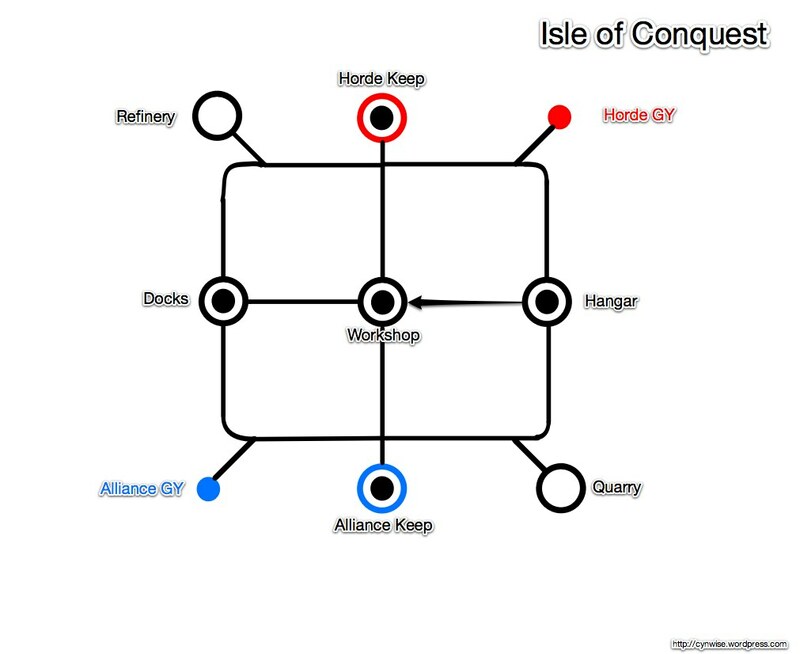 Isle of Conquest: Either take the Docks and protect the Glaives, or take the Workshop and kill the Glaives. It’s all about the Glaives and their ability to take down a wall quickly. These strategies are simple and easy to communicate. You can type them out while buffing the raid, waiting for the gates to open, or even while riding to the first objective. They don’t depend on having specific types of players, or even roles. While experienced players understand how their class fits into these strategies, new players can focus on the main task at hand and still contribute. Given the ways in which Battlegrounds are put together, this is actually about as good as your strategy is going to get. If your team follows them and executes them well, you’ll probably win. If these strategies are so simple, why is it that they don’t seem to work all the time? How is it that you can shout out “fight at the flag!” in Arathi Basin and yet somehow still lose? Because the best strategy in the world doesn’t mean a thing if the individual players can’t execute it. Your composition could be poor. This isn’t just needing a different class ability to get past a boss; this is completely lacking a vital role in your team. Luck of the draw gives you who it gives you, and if you’re without healers or ranged DPS, tough. Win anyways. Your players could not know what their assignments are, misunderstand who is doing what, or go to the wrong place. Because there’s so little time to plan, there’s no real way to hand out assignments to individuals. At best you might be able to divide everyone up by raid groups, but that rarely works as well as you might think it should. Your players could be outgeared by their opponents. They don’t play poorly, they just lacked the gear to do their assignments. Your players could be outnumbered and overwhelmed. It’s very hard to overcome multiple enemies; if you do, it’s either because you’re really good, or they were really bad. Your players could play poorly or AFK. Let’s be blunt; some players are not good at PvP, and some of those just aren’t very good at Warcraft. Perhaps they’re new and learning, or perhaps they just stumbled their way through it for years. Or maybe they’re completely AFK, leeching honor. Either way, they’re not getting their jobs done. In many ways, it’s a wonder anyone wins any battlegrounds at all! The best strategy in the world means nothing if your teammates fail to win the fights they need to win. Fortunately, there are things you can do to combat these problems. Talk in /bg chat. Don’t just talk about the strategy — call out incomings, tell people where you’re going and where the enemy is going. Identify healers early and often. Make sure everyone knows who they are so they can protect them. Learn to win the 1:1 matchups. I don’t like dueling per se, but it’s great practice for you to learn what to do when the only one you can rely upon is yourself. Make sure your character’s gear and skills are as good as you can make them. You don’t have to min/max, but train up your professions, come prepared with food and bandages, add some PvP gear in there to help you win. Individual excellence matters. It’s what powers the simple strategies above – the ability to have players do their jobs. Battlegrounds are no different from heroics or raids in this respect — you have to have people who can do their part. And the more people who do well, the better off your strategy works. Individual excellence matters. Strategy matters. But individual excellence en masse matters more. The six simple strategies will work for you — but only if your team can execute. You have to have a strategy to work together as a team, but your team has to do their job as individuals to make the strategy work. Given how chaotic the battleground is, these strategies are the best you can hope for. The rest is in your hands.